Bubble formation is unsightly and unacceptable on stamped concrete. ChemMasters offers several bubble resistant, low-VOC sealers for decorative concrete. No matter how well stamped concrete is installed, it doesn’t meet customer expectations until it has the right sealer applied to it. Sealers are responsible for color development, wetting out and highlighting the antiquing release, and providing the “wet look” associated with most stamped concrete. As a result, the performance of that sealer is critical to everything that comes before it. One potential problem with sealers used on stamped concrete is bubble formation. Bubbles may not be readily noticed on many concrete finishes, but are quite visible and unacceptable on decorative finishes like stamped concrete. As you’ve probably found, bubbles can be quickly knocked down with a xylene (or xylol) wash, but under the right conditions can reappear hours later. They seemingly grow out of nowhere, initiating a dreaded “call back” for which there is no additional compensation. Fast Solvent Evaporation – Low-VOC solvents evaporate quickly at the surface. Characterized by immediate bubble formation as trapped solvent cannot evaporate into the atmosphere. Outgassing – Concrete surfaces contain many capillaries and pores. As air in those void structures warms, it expands. Sealer that is still in a pliable phase can “blow a bubble” under this pressure/expansion. Outgassing is most common in deep recesses and joints. Over Application – If the wet coating is too thick, it will trap solvent as the surface skins over. Solar Energy – No surprise here… a surface is warmer in the sunlight, increasing bubble formation. Air Movement – Interestingly, a brisk wind can skin over a sealer faster than high temperatures, trapping solvent beneath the surface. Solvent Entrapment – Entrapped solvents cause the sealer to remain pliable for extended periods, making it more susceptible to delayed bubble formation. Resealed concrete is more prone to solvent entrapment due to additional coating thickness. Decorative sealers are reapplied when the gloss has diminished, not when the sealer is gone. Solvent that keeps new sealer liquid also re-dissolves old sealer, introducing solvent deeper into the coating where it becomes trapped. Entrapped Air – Vigorous rolling, particularly when re-sealing, can entrap air into the sealer. Bubble formation is far more common in states and provinces with low-VOC limits. As a result, many manufacturers’ instructions restrict use of low-VOC sealers to the coolest times of the day (early morning and later evening), and out of direct sunlight. Although these instructions are marginally effective, they’re not very realistic for most contractors who work throughout the day when the sun is likely shining. It’s no wonder contractors are frustrated. To make matters worse, restoration of user friendliness to low-VOC sealers is not easy in this day of solvent regulation. Manufacturers are limited to a short list of VOC exempt solvents dictated to them by government agencies. Many contractors have bounced around from product to product, manufacturer to manufacturer, without satisfaction. Finally, the time has come to solve the bubble issue for low-VOC sealers! ChemMasters has introduced two new, low-VOC, non-yellowing products that are specially formulated to be bubble resistant. Polyseal EZ is bubble resistant cure & seal available at a price that is competitive to most low-VOC products currently on the market. Stamped & Decorative Concrete Sealer 400-A is a high performance, premium sealer. Both are designed to be bubble resistant, even during midday heat and direct sunlight. 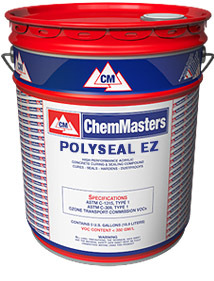 Use ChemMasters’ specially formulated, bubble resistant products like Polyseal EZ and Stamped & Decorative Concrete Sealer 400-A. They let you work all day, in elevated temperatures and direct sunlight. Thin to win! Don’t over apply sealer which may trap solvents and form bubbles. Adhere to the manufacturer’s recommendations. If necessary, apply two thin coats instead of one thick coat. Be careful when re-sealing. Don’t apply sealer so often that the coating becomes too thick. Brush out your joints. Don’t allow excess sealer to accumulate, and prevent bubbles from outgassing. Roll gently so as not to entrap air in the coating.